Every girl knows the struggle of finding the best hairbrush: they all look good, but they do not all equally suit your hair type. What if we found the most multipurpose and dependable hair tool? After all, pro hairstylists include the boar bristle brush in their lists of beauty must-haves. Thinking of buying one? Then read our exclusive rating of best boar bristle brushes. We selected 7 budget-friendly boar bristle brushes for a range of hair types. No matter what your hair length and texture, you will definitely find a tool here for your at-home beauty salon. Check out all the benefits below. Boar bristle brushes are known for their ability to detangle, condition and tame locks of any texture. However, being perfect for brushing, they are not always good for styling purposes. Ineffable Care created a product that accomplishes both missions. The Ineffable Care brushes have shorter pure boar bristles and longer plastic pins. Don’t be upset by the fact that bristles include nylon pins. Such mixed brushes are better detanglers, they are easier to clean and more budget-friendly. The Ineffable Care brushes are made of flexible plastic. Heads are wide and have an ergonomic curved shape. The anti-slip covering of the handles makes these brushes even more comfortable to use. As for the packaging: we like the brand’s idea to sell two brushes in one set. You will not have to hide your new miraculous tool from your family members (a lot of reviewers write that they had to). Take one for yourself; give the other as a present to your daughter or husband. Thanks to the curved design, the Ineffable Care brush gently hugs the contours of your head. This allows you to get very close to the scalp and enables styling from different angles. Natural boar bristles massage the scalp and stimulate the blood flow. Added nylon bristles help to detangle thick hair. As reported by some reviewers, this brush shortened the time they used to devote to getting rid of knots by up to 75%! The main trick any high-quality boar bristle brush does is promote natural hair oil stimulation and spread it from roots to tips. You will not have to add any heavy and costly hair products. You have your own natural oils that will make your hair strands shiny and healthy. Though it is recommended that you brush only dry hair strands, as wet hair is more prone to breakage, the bristles in this tool are very thin and don’t damage locks. As practice shows, such brushes are great for working with extensions. Especially those attached with the hot Keratin method. 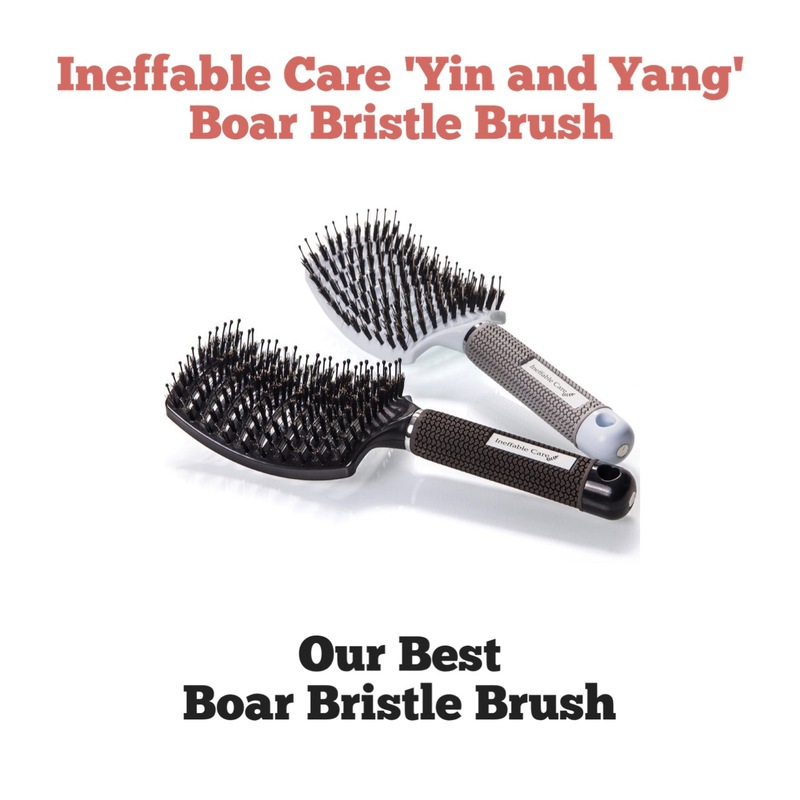 Is the Ineffable Care tool the best boar bristle brush on the market? Possibly yes, as it may be a great substitution for all your home brushes. The tool is equally good for gentle brushing, painless detangling, blow-drying, and styling with flat irons and curling wands. The Ineffable Care brushes are safe for all hair types but work best for long, luscious locks, for thick hair and curls. They get close to the scalp, which is great for ladies with shorter cuts. Women with fine hair will benefit from additional the shine these brushes give. Girls with oily locks will be able to skip a day or two between washes. Want to look like you just stepped out of a professional salon every morning? The majority of reviewers write that the Beauty by Earth hairbrush can create this effect. It makes hair not only shiny but also frizz-free (while the disadvantage of some brushes with boar bristles is creating light frizziness). As with any budget boar bristle brush, the Beauty by Earth Bamboo tool combines pure 100% natural boar bristles and longer nylon pins. Why do they have different lengths? The longer nylon pins are for detangling and massaging the scalp. Shorter natural bristles spread sebum oil from the scalp to the ends. Shiny locks without using oil treatments are now a reality! The handle and oval paddle are made of bamboo. This is why the Beauty by Earth boar hair brush can be called one of the most eco-friendly on the market. Bamboo trees have a rapid re-growth cycle and quite a high yield compared with other timber. The Beauty by Earth Bamboo brush may be used by women, men and even by kids. A perfect detangler, it doesn’t cause hair breakage and prevents split ends. According to reviews, it copes well even with “wild afro hair.” It maintains shiny, healthy hair. The Beauty by Earth brush, which is often called a “green brush”, conditions hair so well that some women even use it instead of shampooing! We do not persuade you to do the same, but less frizz and flyaways, more shine ’n’ softness are guaranteed after just one use. For maximum benefits the manufacturer advises brushing hair at least 3 times per day: in the morning, late in the afternoon, and before bed. If your hair is naturally curly, use the following boar bristle brush before showering, but detangle locks with a wide-tooth comb first. Summing up all the reviews on Amazon, it becomes clear that the Beauty by Earth Bamboo tool is a favorite among low-priced boar bristle brushes. No wonder when it looks like a pro brush, gently pampers hair and gives the scalp a deeply relaxing massage. Beauty by Earth’s product is eco-friendly, lightweight, and works for normal and thick hair regardless of length. The packaging looks very cute, so the tool would make a great present for somebody who appreciates ease of use and aesthetic design. The set can be called “1 brush fits all”: you will easily detangle all knots, add shine to your locks and create cute waves and curls. We are always in a hurry and need such time savers in our lives! Dovahlia’s brush is a tool with pure boar hair bristles and a bamboo handle. One more important fact: the boar hair in it is sheared. A lot of buyers ask about this feature. Unlike plucked hair, which is extracted with roots, sheared hair is cut, and this procedure is carried out multiple times during the animal’s life (this is not wild boar hair). Moreover, as the manufacturer promises, the boar hair here is first-cut, i.e. stiffer and more effective. Bad news — pure boar bristles are not great at detangling… Luckily, the set includes a wooden wide-tooth comb. Use it after showering to unknot tangled strands. Blow-dry or air-dry locks. Now take your boar bristle hair brush and you will feel the difference in using a set of two ideally matching tools instead of all your regular brushes put together. Pure boar hair is firm enough to massage the scalp but doesn`t irritate it. Bristles tenderly carry natural oils from roots to tips and hair feels and looks fresher than when all sebum is concentrated near the roots. As reviewers say, the brush instantly improves the hair texture and reduces the use of multiple hair products. Note: when you start to use this boar bristle brush, you may experience an increase of static in your hair. This happens not because the brush is bad or fake. Boar bristles separate each hair strand to condition it with natural hair oils. This is the cause. To lessen the discomfort calm hair with your hand. Also try brushing locks right before going to bed. Sometimes you need to help your hair get used to 100% natural materials and components. Do you remember the first time you tried a no-poo sulfate-free shampoo? The same goes for pure boar bristles. If you have long, full hair you’ll have to brush it in 2–3 inch pieces to achieve the desired result. For easier brushing, bend over, flip your hair in front of you, and brush strands from the nape of your neck to the ends. The manufacturer Dova Direct offers a 365-day guarantee, but online registration is needed. The brush comes with a hygge travel bag, so you may take it with you wherever you go. The Dovahlia boar bristle brush, according to the manufacturer, works best with delicate, fine and thin hair. Although natural boar bristles are very gentle, this tool might not be the best choice for tough curls and thick, wavy locks. Dovahlia`s brush itself does not detangle hair, so following the instructions and using a wooden wide-tooth comb before brushing is very important for best results. Dovahlia’s boar bristle hair brush is the most expensive in our selection, but reviewers swear it is worth every penny. Suprent BBB was invented for quick blow-drying and easy styling. Nano and ion technologies, ceramic coating, and pure boar bristles — it seems to be a perfect tool for your hair from all angles. What do reviewers say? Suprent’s boar bristle brush is made of plastic; the bristles are natural with plastic insertions. Unique on the market, this ceramic barrel brush lightly heats up during blow-drying and retains heat. This helps not only decrease drying time (large vents provide great air-flow), but also creates volume or makes long-lasting curls, depending on the desired effect. Simply put, it can be a substitute for the curling iron. We have previously mentioned the frizziness that boar bristle brushes can trigger. This is not the case here. The barrel`s special nano ionic technology gives the opposite effect. No frizz, no static, and no product build-up. The size of this particular model is 1.3 inches, which is especially good for shorter locks. It is a lightweight tool with ergonomic design. The textured handle doesn’t catch or pull hairs. Its metallic gold color definitely adds points to its attractiveness. The brush is designed for flash-quick drying and smoothing hair. It repairs dry locks and makes them lustrous and shiny. The large, round shape, when used for straight hair, adds bouncy volume. If you have curly hair, your result will be conditioned and slightly loosened waves. The brush`s main goal is a healthy, revitalized scalp, and it reaches it easily. According to reviews, it marvelously purifies and freshens hair. This is how to use the Suprent tool: brush the roots up and away from the scalp, point the dryer toward the roots and follow the path set out by the brush. Generally speaking, use it for all strands you want to visually become fuller. For longer locks you will need the same tool but in another size — something in between 1.4” (35mm) and 2.2” (55mm). Bear in mind also that a smaller diameter allows more curl or bend, larger diameters give C-shaped waves and fullness. The bristles in this brush are all different in length, this helps to grab every hair on the head, and even pro hairstylists are delighted with this feature. Suprent’s brush is made with a mix of nylon and boar bristles. It’s great for curling and adding definition to the hairstyle, creating flips, a smooth, rounded finish or volume at the scalp. It gives a really nice lift. The barrel`s ceramic coating helps to distribute heat evenly during styling. The 1.3-inch size works best for shorter locks above the shoulders; for other hair lengths you’ll need smaller or larger diameters. The Suprent boar bristle round brush has a high rating on Amazon and we have no reason not to trust it. Worth trying! Paddle brushes are especially helpful when you need to get rid of frizziness. Gran Naturals’ boar bristle paddle brush does this perfectly plus it polishes locks and makes them more manageable. This big, flat brush has over 1K positive reviews, so this time we had a huge array of opinions to analyse. Read on to find out the results! First, let’s define the visual advantages of the brush. It is very wide and the handle is made of wood (though it is not clear which exactly). The bristles are short (1 cm.) and pretty stiff but become softer with use. On Amazon the seller doesn’t mention whether they are pure or mixed with nylon hairs, but reviewers report that the sticker label on the bag says 100%. One reviewer explains that bristles in this brush have different thickness and length, while nylon insertions are usually all identical. There are also no longer untangling nylon pins in this brush. You’ll have to match it with a wide-tooth comb. Regular paddle brushes are best for thick and straight hair. On the contrary, the Gran Naturals with boar bristles, according to popular reviews, is not very good for very curly and coarse hair. The bristles are too short to cope with thick locks. For example, buyers write that it will be a waste of money for girls with longer afro-textured hair. For all other hair types it will reduce frizz, stimulate the scalp, prevent oil build-up and naturally condition hair. It gives volume at the roots and shine from the midshaft to the ends — that is what you get for a very reasonable price. Worth adding to your wish list, isn`t it? If you notice static in your hair after brushing, sprinkle boar bristles with hairspray and let them dry. The problem will disappear. While the majority of paddle brushes are used for wet hair, this one is not. Start brushing with the Gran Naturals tool when your hair is completely dry. The Gran Naturals boar bristle hair brush is reported by reviewers as a good choice for ladies with thinning hair, normal and slightly thicker hair types. Although it doesn`t work for women`s unruly wavy and curly hair, it can be used by short-haired men with any hair texture. Short, stiff bristles pleasantly massage the scalp and spread sebum from roots to tips, making hair shiny. The final verdict: Gran Naturals’ tool is not good for styling but is a perfect brush for straightening and smoothing locks. What is the foolproof formula for the perfect salon-worthy blowout? A powerful dryer and the right smoothing and volumizing brush. So if your haircut urgently needs dimension, Xtava extra-large boar bristle round brush may fill the gap in your beauty arsenal. Reviewers say that even beginners are able to create their desired salon look with it in no time. Xtava brush is made with a combination of natural boar bristles and synthetic nylon pins. It is specially designed to be sturdy enough but very lightweight at the same time. It has a dryer-friendly design. Its wooden handle makes the brush easy to use and stays cool during styling. Yes, you understood right: you can use it while blow-drying hair. Xtava brand believes that one size does not fit all in terms of hair care. This model has 33mm bristles; it is best for adding volume and detail to medium-length hairstyles. The duet of boar bristles and nylon pins not only detangles and silkens, it also gives body to flat, limp hair. For cropped locks choose the 22mm tool, it creates perfect curls and flips. For long hair buy Xtava 44 or 55 mm brushes, they will easily deal with straightening and smoothing tasks. When blow-drying with the double body boar bristle brush, process hair in 2-inch sections, and always direct the airflow downwards. This will make your locks really smooth. Xtava’s 33mm boar bristle round brush is best for maximizing volume at the roots and adding flips to the ends. Works for both fine and thick hair textures, for medium to long locks. Perfect if you have one of the bob haircut variations. Reviewers report shaping gorgeous body with this tool, so be ready to enhance your beauty routine and take your styling skills to the next level. One of the few boar bristle brushes that are rated 5 stars on Amazon. It performs surprisingly well even for the thickest hair types. Reviewers` verdict is that it fully meets expectations. Combines natural boar bristles and nylon pins. Plastic heads on pins make detangling and brushing hair a lot less painful. It is especially great for sensitive scalps and for fine hair. The rounded plastic head is large enough to enable quick brushing with just a few strokes. A soft rubberized coating provides better grip. Thus using Vamix is totally comfortable and enjoyable. Its metallic gold color makes this brush very stylish. At first sight the brush with such thin bristles may seem helpless in processing long, thick locks. In practice, it is strong enough to detangle and defrizz unruly hair. Reviewers adore the way this brush copes with thick, curly strands and report fave straightening and smoothing effects of the tool. Apart from being top-rated and super-detangling, the Vamix natural boar bristle brush is also cleansing. If you have a dry scalp or dandruff, the bushy bristles will clean flakes. It can also brush out any excess amount of hair care products. Although the manufacturer advises using the Vamix brush on wet hair, reviewers do not recommend this. Vamix has stiff boar bristles that may pull out wet hairs. So, the Vamix boar bristle brush is suitable for all types of hair, but the preferable length is medium to long. It is great for the price as it helps to get rid of three annoying problems: tangles, brittle locks and flakes. Vamix’s brush straightens, conditions, clears scalp from sebum and brushes out shedding dead skin cells. Natural boar bristle brushes usually start from $10 and can reach up to $200! What`s the magic? All your questions about BBBs’ benefits and features are answered below. Read on and dispel your doubts completely. What Is a Boar Bristle Brush? Made of boar hair, of course! There are some nuances though. Boar bristles may be pure, semi-natural or synthetic, with or without detangling nylon pins (with safe ball tips on the ends or bare). How can you check whether boar bristles are 100% natural, as a manufacturer promises? Look at the bristles. If all hairs are the same, they are pure. If you see a mix of very thin and very thick insertions, thicker ones (often gray or light brown) are synthetic. Natural hog hair is softer; nylon additions are packed more chaotically. And one more, possibly disturbing, question is about the ‘nationality’ of boars. Not all manufacturers want to uncover their secrets and give a clear answer. However, some of them claim that the hog hair is from China, and the brushes themselves are also made in this country. Why Is a Boar Bristle Brush Good? Does a Boar Bristle Brush Make Hair Look Oily? Nope. Boar hair has a unique structure, which is very similar to human hair. Yes, a brush with boar bristles carries sebum from the roots to the tips; however, it coats each hair with a very small amount of the natural conditioning hair oil. Your locks will gain added shine and will be smoother but not greasy. Moreover, your scalp will look even cleaner and you will be able to skip several days between washes. How to Use a Boar Brush? In most cases you`ll have to start with dry hair. Brushing wet hair may cause breakage. If your BBB is 100% pure and doesn`t have longer nylon pins, detangle your locks with a wide-tooth comb first. After getting rid of all tangles and knots, start brushing with your BBB from roots to tips. If your hair is long or super-thick, split it into sections and brush them one by one. You may also bend over and start from the hairline. It will boost the body even more. How to Clean a Boar Bristle Brush? Some buyers even ask whether they can put the BB brush in a dishwasher! But we have another method of cleaning your fave beauty tool. Remove stuck hairs with your fingers, a wooden, wide-tooth comb or a toothpick. Dampen the brush. If your brush is made of wood, do not soak it in water as you may do with plastic ones! Just dampen it. Then place a small amount of your shampoo onto the bristles (natural and sulfate-free, of course). Rub the bristles. Do it gently, make sure you are not pulling out any hairs. Soak your plastic brush in water. If your tool is wooden just rinse the shampoo or wipe with a soft cloth. Some people use a toothbrush for cleaning their BBBs. Dry the BBB. Lay your brush on a towel with the bristles facing down. You can always clean it once more after drying with a dry towel in order to get rid of all the remaining dust. Clean your boar bristle brush once a week. Is It Better for the Boar Bristle Brush to Be Made of Wood or Plastic? If you want a heavier, more expensive brush that looks Instagram-worthy, then definitely go for the wood. Moreover, the wood used for brushes is bamboo, and this is a very eco-friendly material. If you want a light and inexpensive brush, choose a model with a plastic handle. The best option is to buy several tools — for the car, for your travel bag, for your husband and child, etc. Do Boar Bristles Fall Out? A very frequently-asked question that has no exact answer. The majority of buyers report in their reviews that they have had no trouble with bristles falling out at all, even after using the tool daily. Manufacturers, in their turn, write that some bristles may fall out, it is normal. The truth probably lies somewhere in between: if you see a reasonable amount of hair fall, keep calm; if the bristles fall out drastically, ask for a refund. Do Vegan Boar Bristle Brushes Exist? Of course, there are alternatives with synthetic bristles, which can do part of the work that a 100% pure BBB does. However, they do not work as well. People on forums also mention sisal and cactus-based brushes. This sounds strange but they are reported to be better than synthetic materials. Generally speaking, a lot of vegans use BBBs as cutting hair from farm-raised animals is not harmful and in most cases cannot be considered cruel. There is a phrase that advises investing in hair as it is a crown we wear every single day. A brush’s quality directly influences your hair’s condition. A bad one can make your locks weak and lifeless. A good brush will add softness and shine and will become a clever investment. We advise you to try one of the abovementioned best boar bristle brushes if you are tired of switching between several tools for every type of hair styling routine. It may be an easy way to put an end to your suffering. Happy brushing!